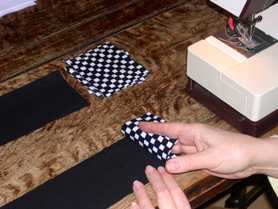 The easiest way to keep your quilt square is to attach lattice (also called sashing) and cornerstones. For a nine block sampler, you will need 24 pieces of sashing. 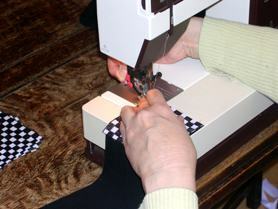 With your rotary cutter, cut 8 strips 3 1/2" wide, across the width of the fabric. cut three pieces of 3 1/2 x 12 1/2". cut two strips 3 1/2" wide. cut sixteen 3 1/2" squares. First decide where you wish to place your finished blocks. It is best to tape them up on a wall, or lay them on a bed to determine the layout. Sew your quilt together in rows. 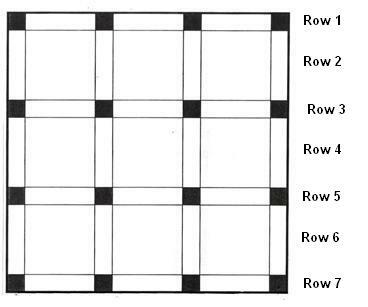 The first row as shown below is a sashing row. It begins and ends with a cornerstone. The second row consists of vertical sashing strips and three of your quilt blocks. 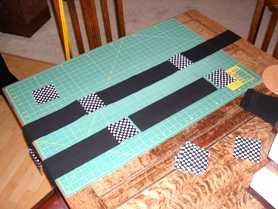 Sew this to the first row, being careful to match and pin the seams at the cornerstones. The third row is cornerstones and horizontal strips exactly like the first row. Attach it to row 2. Row 4 and 6 are made up of blocks and sashing. Rows 5 and 7 are identical to rows 1 and 3.